Presidency Council leader Faiez Serraj and Libyan National Army leader Khalifa Hafter have agreed that there has to be a ceasefire and new elections in Libya. The agrement came during their talks today near Paris. “We commit ourselves to a ceasefire” and “we make a solemn commitment to work for the presidential and parliamentary elections as soon as possible,” Sarraj and Haftar said in a ten-point declaration. – their first such public joint statement. However, in an indication that nothing is cast in stone, the declaration was not signed. Among other points of agreement, they agreed to would work on a roadmap that would see a united military combatting terrorism and dealing with illegal migrant flows, and called on the UN Security Council to support their agreement and the new UN special envoy Ghassan Salamé to undertake consultations to that end with the various key Libyan players. Salamé took part in the discussions. In response, French President Emmanuel Macron hailed the “historic courage” of the two men, saying that “today, the cause for peace in Libya made major progress”. Serraj called it a “great step” towards reconciliation and lasting peace. So far, despite the unlikelihood of it appealing to certain members of the HoR such as the National Sovereignty Bloc or HoR president Ageela Saleh, the meeting and agreement have drawn initial tentative approval from a number of HoR member and those of the State Council. Benghazi HoR member Abu Bakr Buera has said that the Paris meeting could create a political momentum in Libya while State Council member Wahid Barshan praised it on the basis that it would lead to fresh elections. In a sign of dissent, however, the Muslim Brotherhood’s Justice and Construction Party issued a testy statement criticising the meeting, saying that any such gatherings organised by individual countries were a deviation and distortion of the LPA and opened the door to those countries using their influence for their own interests. 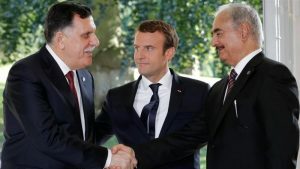 The President of the French Republic, Emmanuel Macron, wished to contribute to the resolution of the Libyan crisis by inviting on 25 July 2017 in La Celle Saint-Cloud, the President of the Presidential Council of the National Unity Government, Fayez Serraj, and the Commander of the Libyan National Army, Khalifa Hafter. This initiative comes in full support of the mission of the new Special Representative of the Secretary-General of the United Nations, Ghassan Salamé, who participated in the exchanges on 25 July. The objective of France is to contribute to the development of a political solution and to help the Libyans to strengthen the inter-Libyan political agreement of Skhirat so as to make it more effective and inclusive. The meeting at La Celle Saint-Cloud is a continuation of the meetings that have already taken place at different levels, in Abu Dhabi, Cairo, Algeria, and takes up those elements that have been agreed. It aims at the continuation of an inclusive and supported inter-Libyan dialogue in which all actors of good will have their place. We call on the United Nations Security Council to support the objectives of this statement and the Special Representative of the Secretary-General of the United Nations to engage in the necessary consultations with the various Libyan actors.